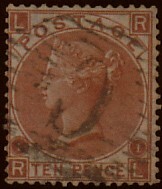 SG 112 the 10d, PL 1, was printed on paper with a spray of rose as WMK. However in error a single sheet was printed on paper with emblems in four corners WMK. Eleven copies in used condition have so far been recorded, seven of these have ‘C’ cancels of Constantinople. Check your 10d stamp now. The catalogue value is £17,500.